How many of you have seen something which looks really cool, and you really want it, it finally comes out, you put your money down, the item arrives! You’re filled withexcitement as you take it out of the box and then a few moments later… Something happens, you’re not sure what it is, but something has happened which now means that the excitement isn’t quite there anymore, it’s rapidly in decline and you can’t figure out why. That’s how I feel about this figure. Announced several months ago, and even showcased at the Sonic 25th party in America, this thing got a lot of people excited, then on release day Kidrobot surprised everyone by releasing a limited edition version with a more metallic colouring (version reviewed here), but otherwise there hasn’t been much in terms of promotion or hype behind this. 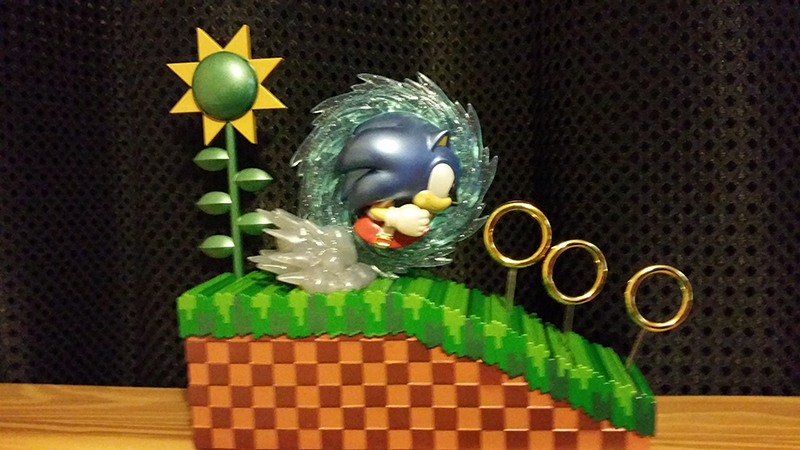 When it turned up, I was really pleased, the box art and design is really cool, a beautiful Green Hill scene which compliments the box window into the statue. Really nice work went into this design. But that’s not the first thing that strikes you, that honour belongs to how small the box is, suddenly, this figure which seems massive, which has been described as being ‘medium’ looks very small. As you remove figure from the box you’ll be shocked at how small the it is. The Sonic figure itself is smaller than most other figures I own, the paint job on it is excellent, the detail is excellent, but the size of it seems really small. 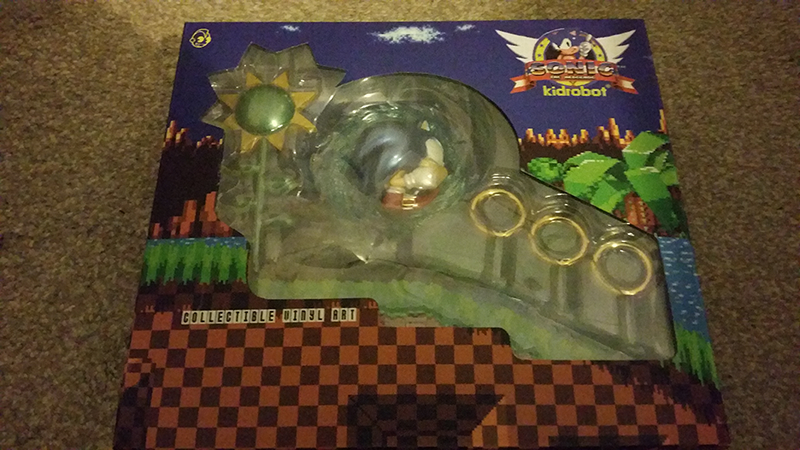 Even the base that the figure sits on, it’s so small and light, in fact it seems smaller than those play-sets from Tomy’s Sonic Boom range. To give you an idea of the size, when fully constructed, it’s barely any larger than a DVD case. Length wise, I think some of you are likely to have TV remote controls longer. This for me is the first thing which ruined the excitement, just a little, but it was a noticeable drop. I think the problem is a combination of factors. The price I paid + the images on the site + the size of the figure = doesn’t seem value for money. The price tag on this is $75 + shipping, but the figure is so light and so small I struggle to see where the money has gone into this, especially when they use the word ‘medium figure’ to describe the product, if this is medium, then I’d hate to see what a small figure is. With the images used to sell it, combined with the word ‘medium’, I can’t help but feel a little cheated. But that said, I have bought small items with high price tags before and loved them and not had any reduction of excitement, so is something else going on? Well… yeah. There’s a few things… wrong, with the figure. The first thing I noticed was that the sunflower doesn’t seem to fit into it’s slot as far as it should, meaning it’s prone to falling over if it’s knocked slightly. 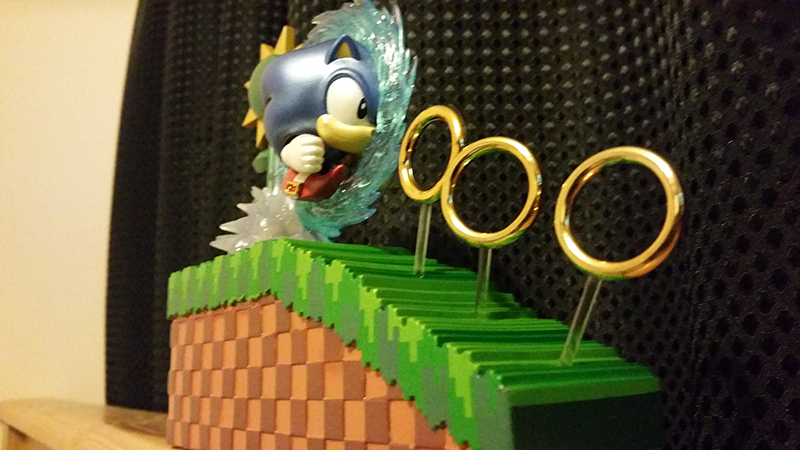 But that’s nothing to worry about, because Sonic has no supports, so he falls over at the slightest knock! No really, there is nothing supporting Sonic on the base, the slightest knock and he falls over. Whilst I doubt he would break unless he fell from height onto concrete or tiled floor, it’s really something that shouldn’t be happening. But the construction issues don’t end there. 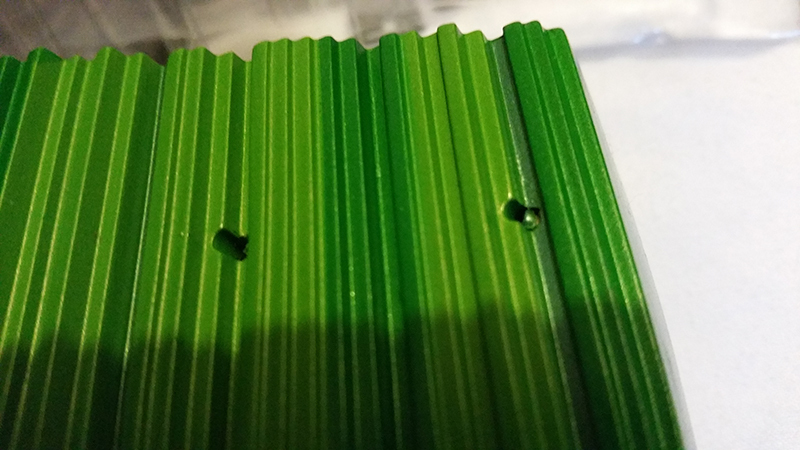 The rings fit into small slots, except on mine, the third ring has a small piece of plastic which has been left from the manufacturing process which is blocking the ring from being put into place, meaning I’ll have to manually cut or drill into the slot to remove the blockage, otherwise the ring doesn’t look right at all and is very prone to falling out of the base. Combine that with the size issue, it’s really reduced my excitement over this. And… it’s a huge shame because, this figure looks awesome when it’s constructed, the box and presentation is really high as well, I love the fact it comes with a cardboard backing board which you can use to help create a small scene if you have it out on display. Heck I even like the fact it’s painted a metallic colour, it’s something different from most of my other Sonic figures and statues yet still looks really cool. I also like the fact you could if you wanted to, position a light through the spin dash around Sonic which gives off this cool light effect. The paint job! My goodness! The paint job is stunning, you expect errors with Jazwares, you expect them with Tomy’s entry level toys, and sometimes you see the odd error on the odd statue from F4F, but this… it really is flawless, not a pixel is out of place, that’s really surprising given the size of the figure and the price point. So, it’s not a bad product, but, the problem is, I should and could easily be sat here cheering this as being the Sonic Christmas toy to get this year, but combined with the problems my figure has and the fact the size is far smaller than it appeared, it’s not as great as I hoped it would be, and with a $75 + shipping price tag, that hurt cuts deeper than it should. If it didn’t have the construction problems, maybe I’d be much more energetic with my praise of it, but because of these factors it has reduced my hype a lot. But if you like the look of this figure, yeah I can recommend it, just be aware you might have to do some D.I.Y. to it and the size might be an issue for some of you. As for Limited or Standard Edition, the only different is the paint type, pick the one you think looks nicer or appeals to you the most, it doesn’t matter, for me, I wanted something different and liked the metallic paint. Video unobxing of the item if you like. Paint job is flawless, absolutely stunning. Box and overall presentation is beautiful. 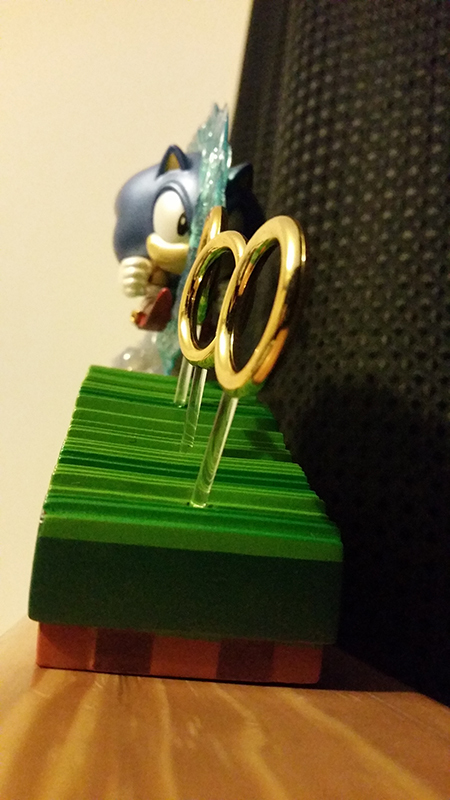 Sonic is likely to fall off from the slightest bump or knock. Some D.I.Y. might be required. $75 + Shipping seems way too high, though this might be lessened if you don’t have D.I.Y. issues. P.S. I noticed something odd when writing this review, on KidRobots website, this is described as a ‘medium figure’, yet on the actual box, there is no mention of that word, it’s described as ‘artwork’, for this review, that is where I bought this figure from, they advertised a ‘medium figure’ I’m reviewing it based on it being a ‘medium figure’. Also another small oddity is that the limited edition version on the website appears to have a special marking on the box, yet on the actual product, no such marking/logo exists, this has been checked and verified with someone else who bought both versions from the same store.